Genre: YA/New Adult, Fantasy, Retelling. This was sent to us from the publisher in exchange for an honest review. This is no way altered my opinion of this book. I feel like I've just read a whole series that spans across three books just from the first one. So much happened in this book that it efficiently blew my mind and I was just so excited reading the whole thing. There wasn’t one point in the book where I wanted to put this book down. First of all, if you’re looking for a fantasy series with an easy and quick to understand world, this one is for you. There are barely any new words to learn that are difficult and the structure of the world makes logical sense that you barely even have to concentrate on the facts. This book is quite different to other fantasy books in the way in which it is written in first point of view (others tend to be written in third). That was a surprise for me, going into this book. However, a welcoming surprise, since I dread reading books with multiple points of view. Feyre’s traits I adored the most. Feyre was initially a huntress and she had a lot of fantastic insight in survival and protecting herself and her family and during her stay at the castle, I felt like since she had no use for it. Thus, her strong character weaned down to a weaker female being that we see in so many castle based books. Luckily, we actually did get to see her skill put to the test once again during the end of the book, so that was satisfying. Okay, let’s get down to the boys. A lot of people think this is going to be like Warner and Adam in the shatter me series and I really just don’t want to think about that at all. I really really love Tamlin and I do ship Feyre and Tamlin together, but I also can see that there is something looming in the distant future. 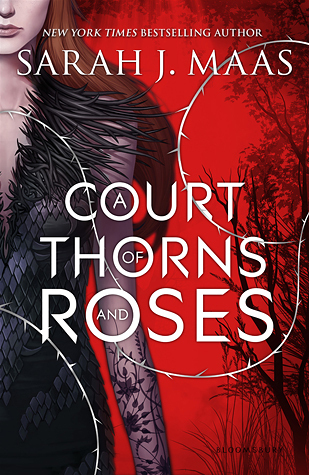 I am just so conflicted because I don’t want to be persuaded off Tamlin but knowing Sarah J Maas, that might happen. The stress is real folks. Anyway, I adored this. I totally recommend this for sure! Thank you Bloomsbury Australia for sending us a copy of this book for review.